Well, its almost the end of summer in India and monsoons are just around the corner. While for most people ‘summer’ means rising temperatures accompanied by humid weather, it is my favourite season of all. Don’t be surprised – I dislike cold weather so winter is out and I am not much of a monsoon person – watching the rains is fine, getting drenched is a no no for me. So spring (if there is one in India) and Summer it is! Having survived the hot & summers of Mangalore, I fared much better in Mumbai where the heat is bearable – you don’t sweat like a pig (although pigs don’t sweat technically) and of course staying indoors and air conditioning always helps cool you down. The best part about the Indian summers is the abundance of seasonal fruits to help bring down the temperature. Nature has wisely made sure the right kind of foods are available during this particular season. While the watermelon is everyone’s favourite to beat the heat, one can’t deny that the Mango is by far the most popular and most loved fruit of the season. The fragrance is unbeatable by any other fruit and the taste dominates everything else making it without doubt, the king of all fruits. Like Vir Sanghvi wrote in a recent article in The Sunday Brunch (supplement by Hindustan Times) that the only place that really smells of mangoes is India. I agree with him that the mango is probably the most versatile of all fruits – from eating it as a fruit in its raw or ripe form, it is also used in numerous sweet & savoury preparations ranging from pickles to jams, preserves, deserts, juices, chutneys, curries – the list is endless. The mango & summer are synonymous for me and never fail to conjour up delicious memories of my childhood where I joined other kids from my neighbourhood to pluck raw mangoes (Thor as it’s called in Konkani) from neigbours’ gardens only to get chased away. Or those times I spent eating scores of ripe ones of lesser known varieties (yet very succulent) at my cousins’ or grandma’s place. Mangoes then were free – Nature’s gift to mankind for protecting her. Almost every house had a mango tree in their gardens amidst a few hundred Coconut, Jackfruit, Chikoo (Sapota), Banana & Amla Trees. Exchanging seasonal fruits between homes was common – so we got to taste different varieties and then play around with the mango stone (seed). The one who finished first would call out to the other by name & whoever responded by saying “yes?” was told to ‘run after the seed’ – so the ‘mango eating’ time was also a time of comical silence as no one wanted to respond to their names being called out. It’s a silly game of course, but it was fun in those days. Honestly, cities have become the bane of our lives. Nothing is free here, not even water. What was enjoyed as a free gift of Nature needs to be paid for today. I paid through my nose for those few coveted Alfonsos from the market last week and I am sure those are probably even sprayed with chemicals to speeden up the ripening. Shae! But what to do? Mangoes are mangoes and must be enjoyed before the monsoons threaten to take over or else one will regret and have to impatiently wait for the season the next year. Thankfully besides having my fill of the Alfonso in Mumbai, I was gifted the small variety of mangoes (called the ‘Nekkari’ in Mangalore) on my recent trip to Goa. These babies are so delicious, you’ll wonder why only the Alfonso enjoys so much attention. 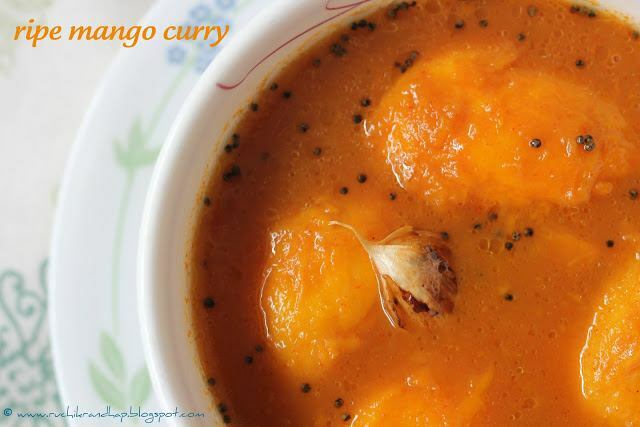 Anyways, I decided to make the most of this seasonal fruit and make my favourite Mango Curry out of it…its very simple if you plan to make a small quantity. In the olden days this curry used to be made with as many as 25 mangoes, but this is one dish which you will either love or hate. So try experimenting with just 4-5 small ones…I am sure you will only L.O.V.E it ! 1. Wash the Mangoes well on their surface and stem area to clean any sap and then carefully peel off the skin from the Mangoes and keep aside. 2. Put the peels in a bowl of warm water for about 10minutes to soften the pulp and fibre stuck to the skin. After 10minutes scrape off the pulp back into the water & discard the peels. Retain the pulp water. 5. In a smaller pan (tadka/tempering pan) heat the oil and add the mustard, when they splutter, toss in the garlic and fry till golden. Add this tadka to the curry. First time here, happy to follow you. Do stop by mine if u find time..
Omg, just drooling over that delicious ripe mango curry,mouthwatering here..
My mouth is watering….brings back those sweet memories of summer! So many memories sweetie, and I love this curry, one of my favourites! 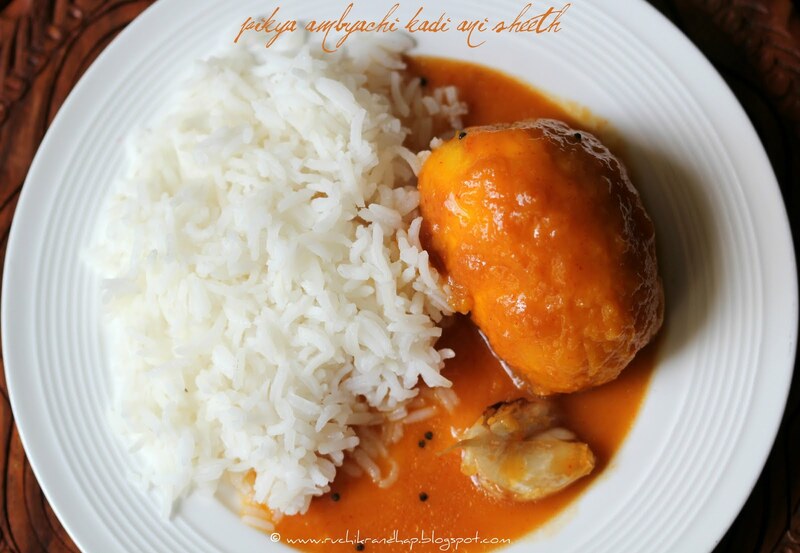 Whoo, wow this is such a drool worthy dish, Ripe mango curry looks awesome. 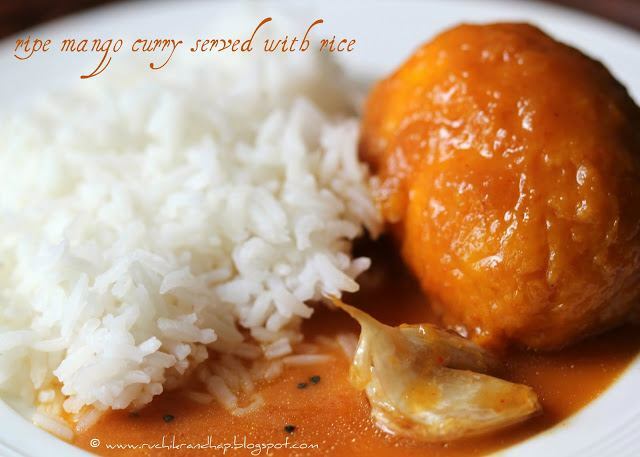 The ripe mango curry looks so yummy Shireen. Have never made curry with ripe mangoes and it is new and comforting.